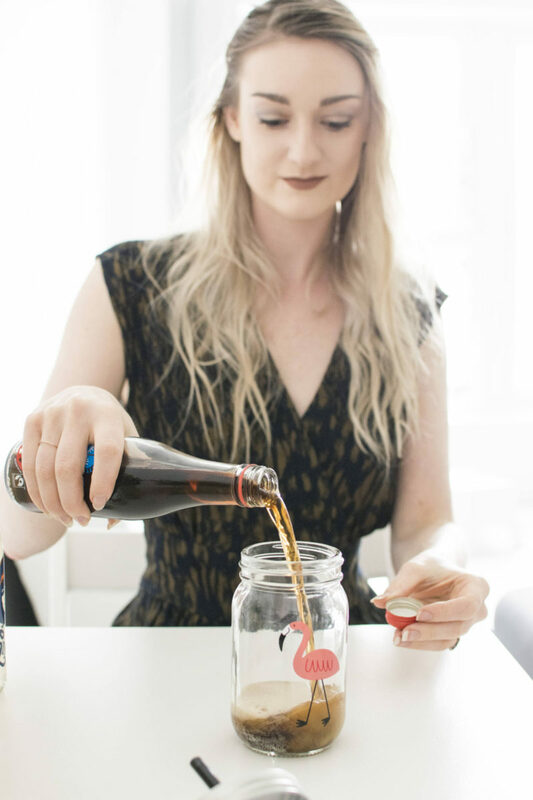 The Karma Cola foundation aims to produce fizzy drinks which stand for a cause. 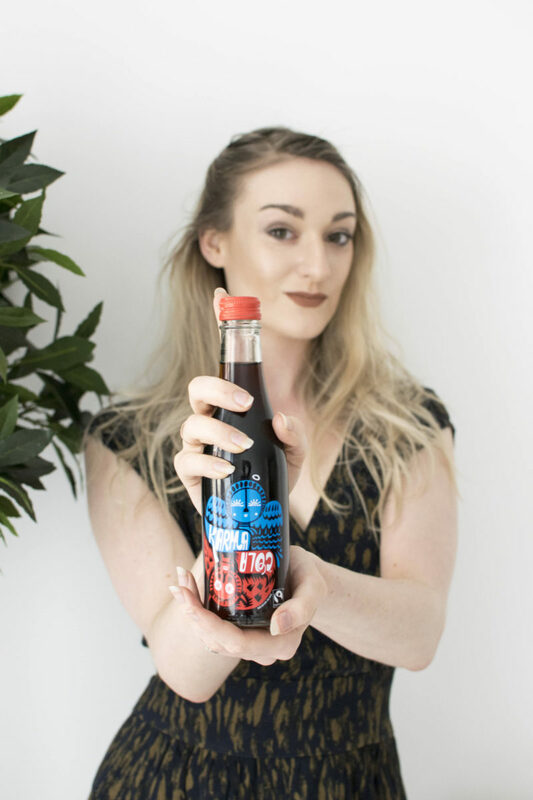 Every drink purchased helps a village in Sierra Leone, Africa and the proceeds help to support a number of Sierra Leonean communities by maintaining local areas to sending young people to school. This is made from a cola nut (yes cola comes from a nut!) all the way from Sierra Leone. It has a unique blend including ginger and lemons which makes for a thirst quenching delight. 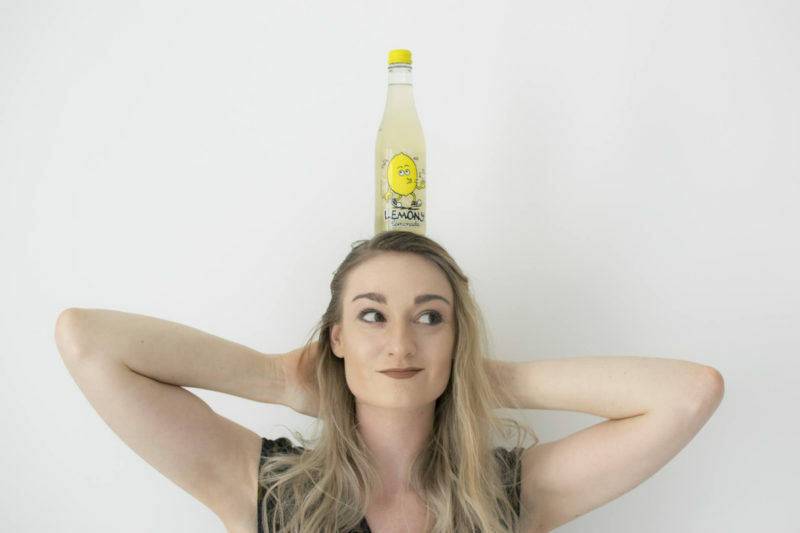 This is a great mix of organic lemons and fair-trade sugar cane which makes the farmers smile. 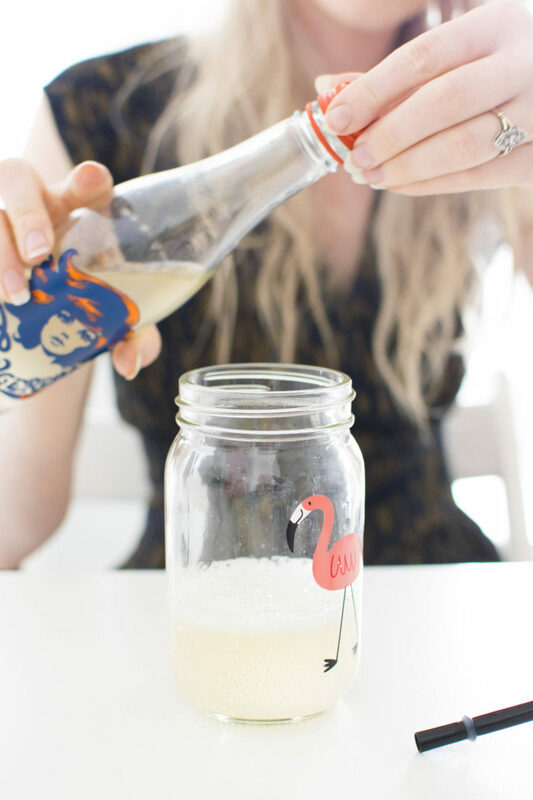 It makes its drinkers smile too as the lemon bursts out and hits all those taste buds. Gingerella is perfect for those wanting a fiery taste. It is quite strong and bursting with notes of vanilla and ginger. 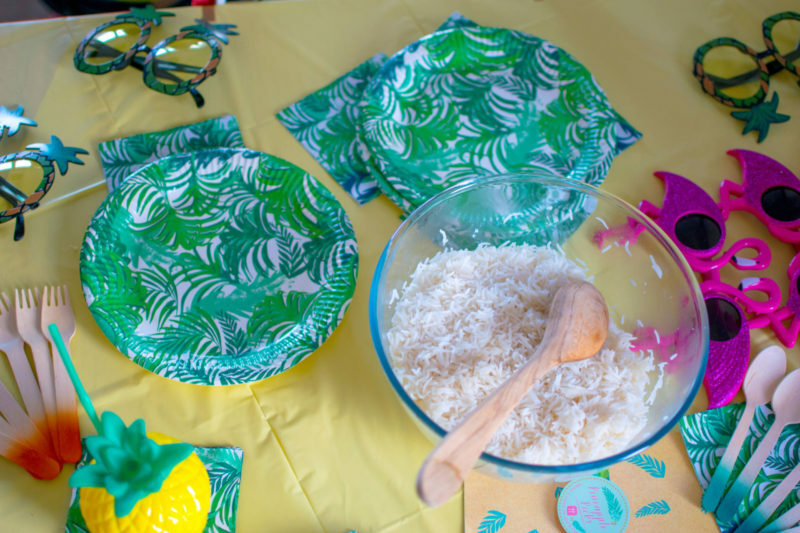 For tips on how to host your own party, I’ve got you covered in my latest post right here! Last week was my final week at my job. I have now left the office for the life of a full-time blogger, and I simply cannot wait to get started! I am hugely excited about this, and so I wanted to throw a little get together with the ladies to celebrate my new beginning. 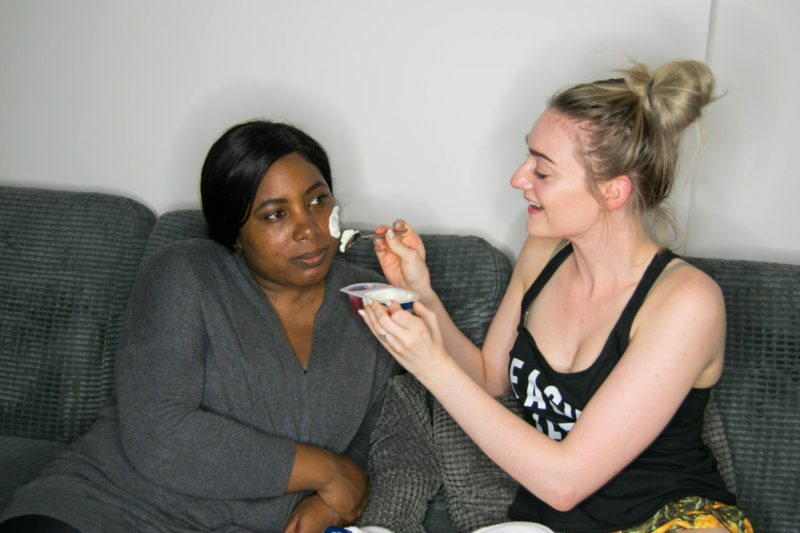 This blog post is all about how to do a ‘girl’s night in’ with style and I have some amazing companies that are a definite must for anyone planning on throwing the perfect party. First up, you need to think about a theme. 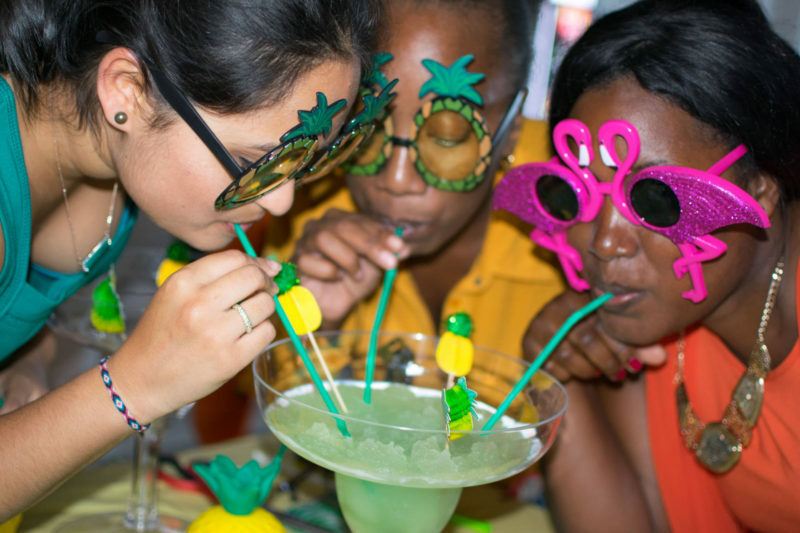 A theme is a great way to get everyone excited and will also help your guests to decide on a dress code too. 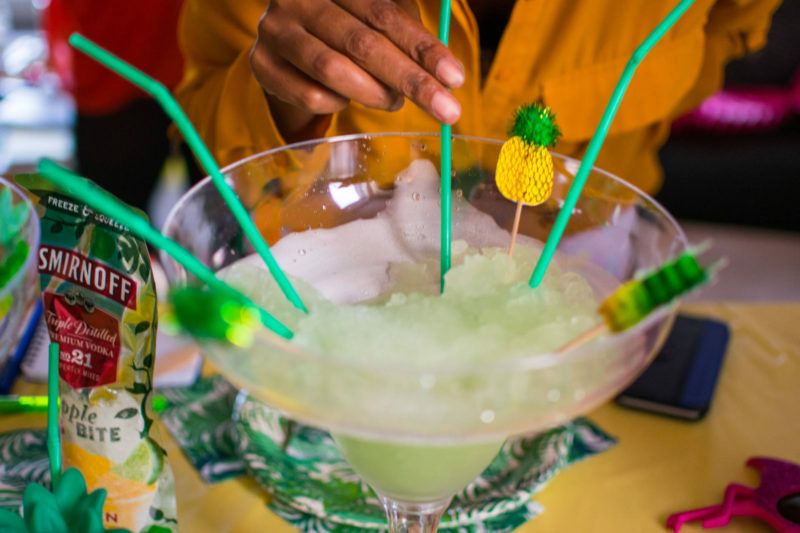 My theme was carnival, so lots of bright colours, frozen cocktails and pineapples! I found an amazing company who helped me with the event, and they are Talking Tables. 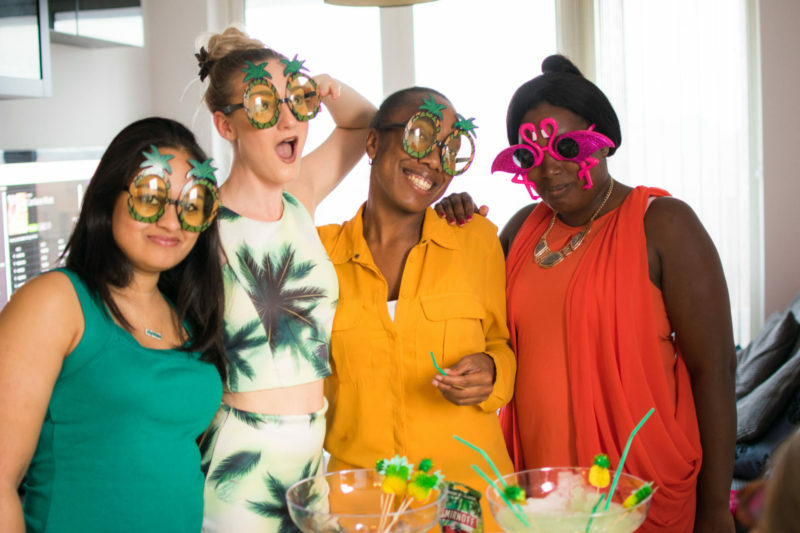 Talking Tables are an online retailer who specialize in party accessories and decorations. 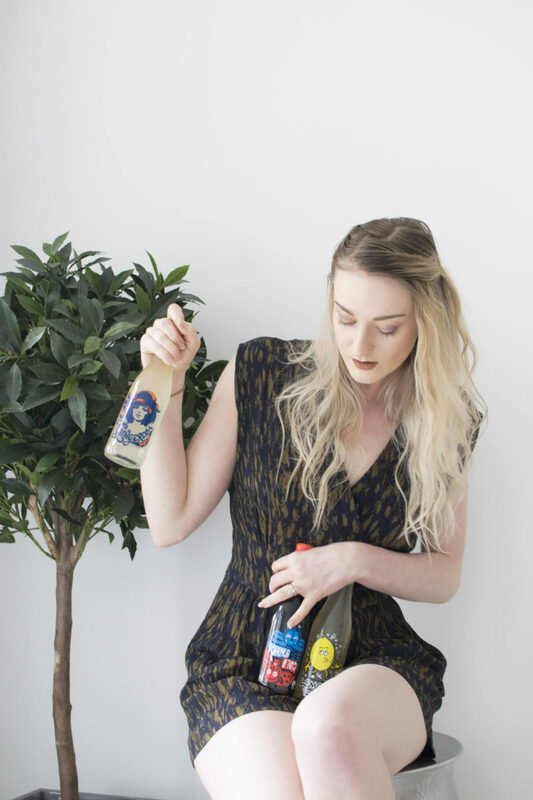 They have so many ranges for any occasion- birthdays, weddings, tea parties and of course an array of excellent goodies for a girl’s night in. 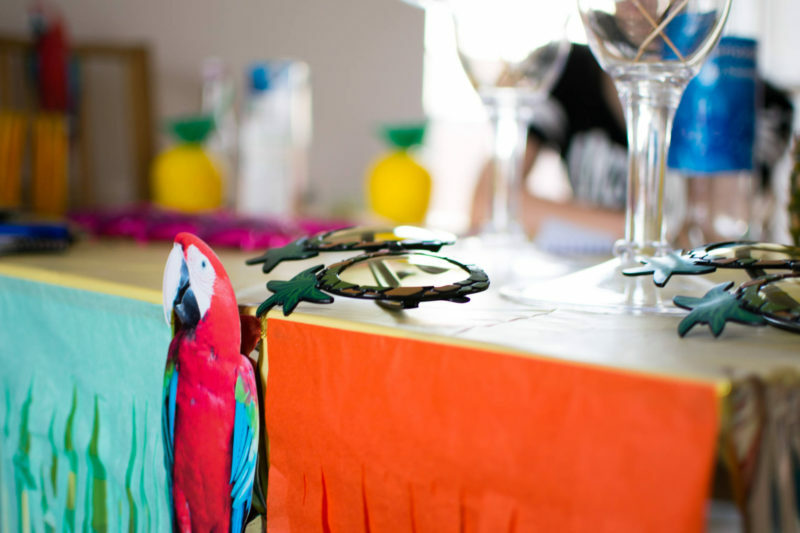 I decorated the flat with fiesta fan garlands around the doors and sofa in wonderful bright colours, and we had a few parrots adorning the tables and chairs! 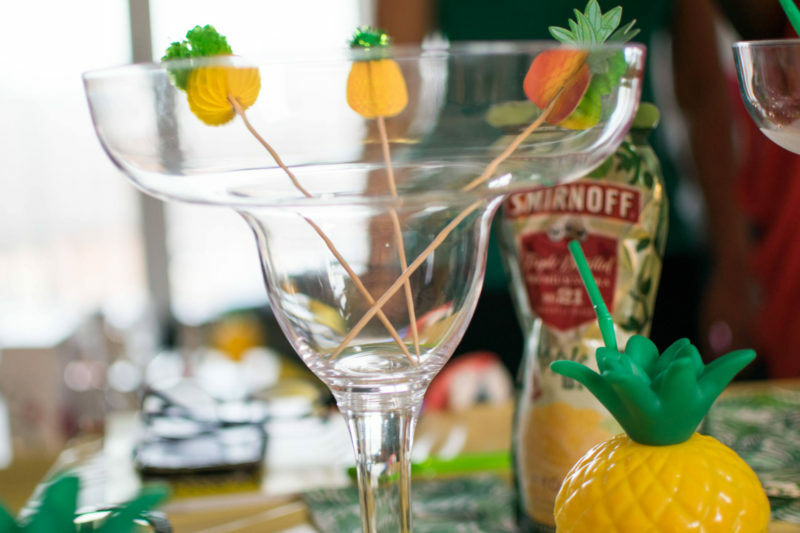 For the main table, we had the most amazing pineapple accessories, from pineapple picks for the giant cocktail glasses to pineapple sunglasses! 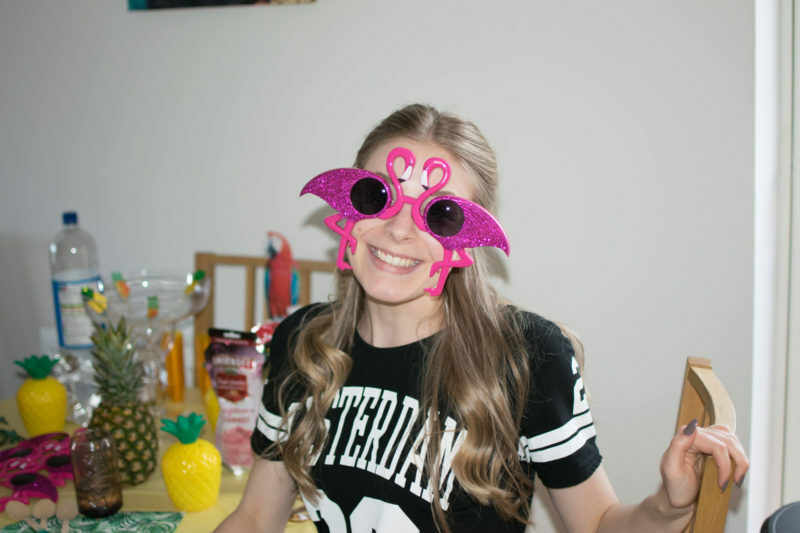 We also had some flamingo ones too for some epic selfies. 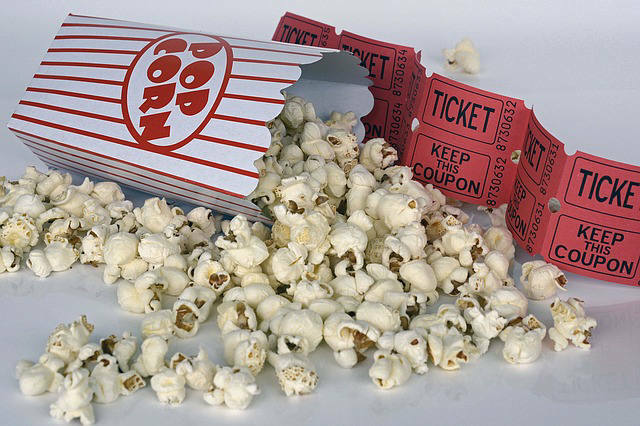 You can’t go wrong with some silly props to get everyone having some fun! 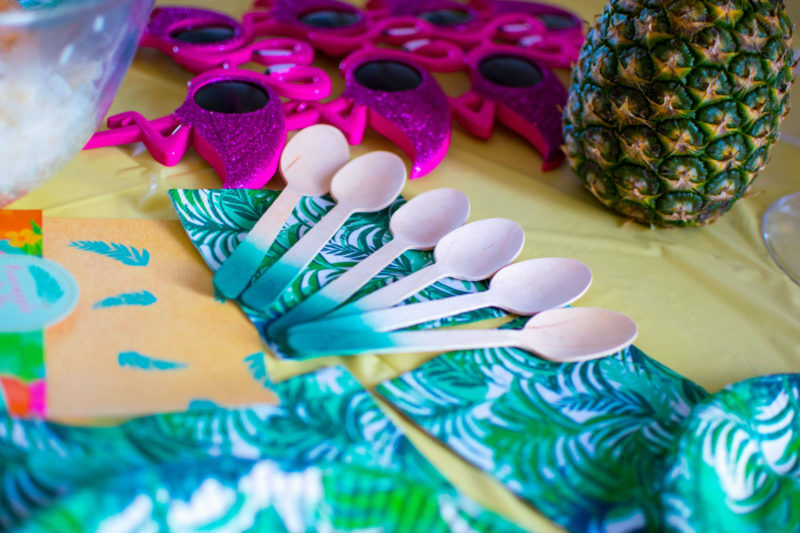 Talking Tables really do have such great quality items, even the patterned plates and wooden spoons helped to tie the whole carnival theme together. 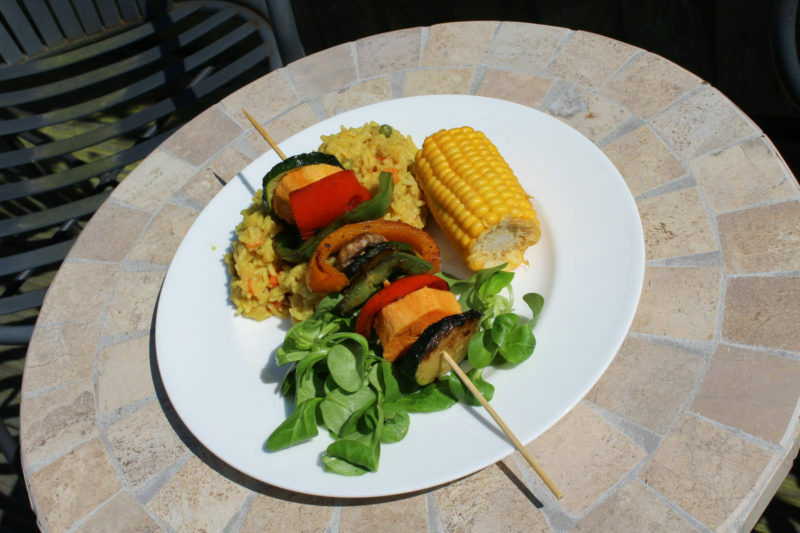 For food, I went for something really easy and simple that you can’t go wrong with- chilli. I made a meat as well as a veggie chilli for everyone in less than 30 mins. 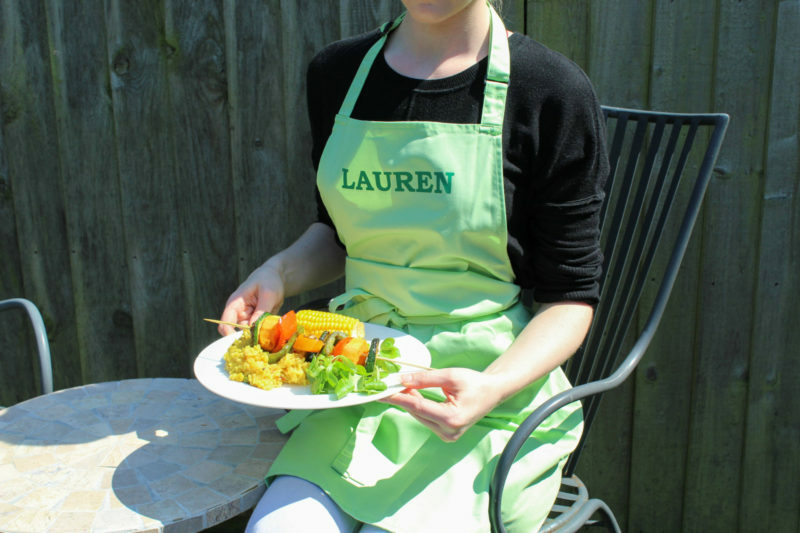 You don’t want to keep your guests waiting ages for food, and getting a takeaway for large groups is pretty expensive. 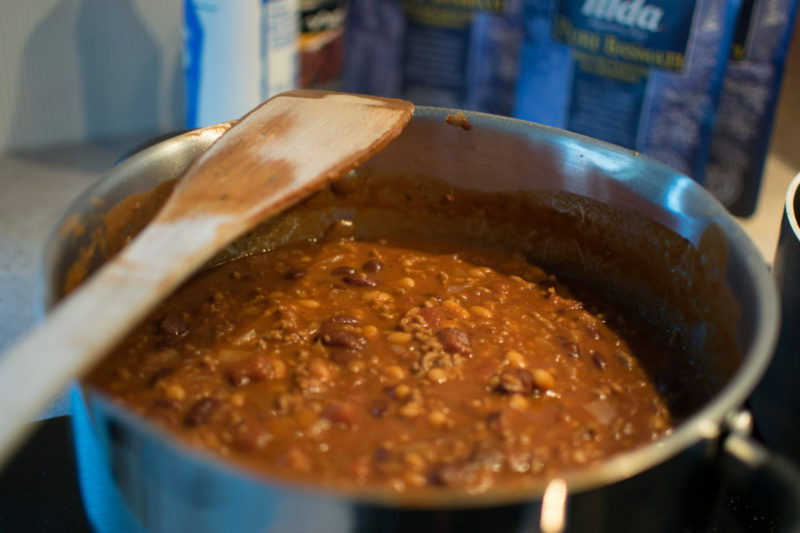 The ingredients for the chilli (mince, tomatoes, kidney and baked beans) plus rice will have you and your guests covered for under £15 which is a great budget, especially if drinks are happening! Onto the drinks, I went for frozen cocktails. 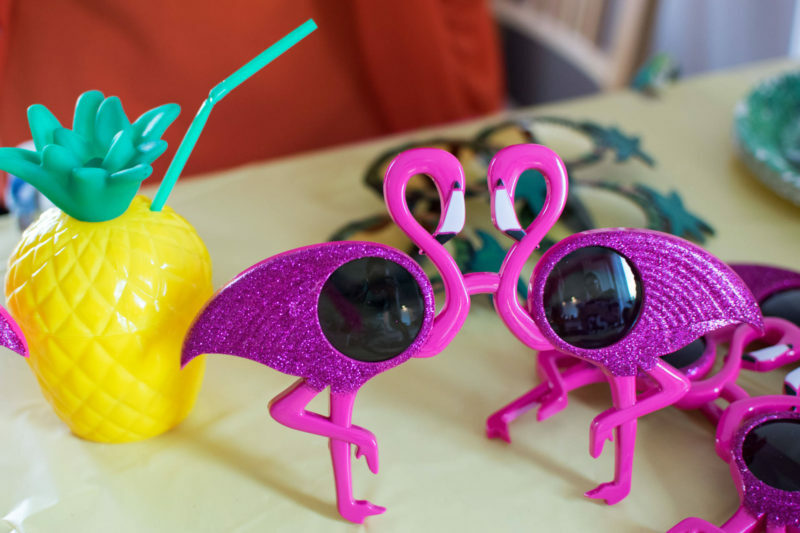 You can get these at all the major superstores and they are the perfect thing for a carnival theme! 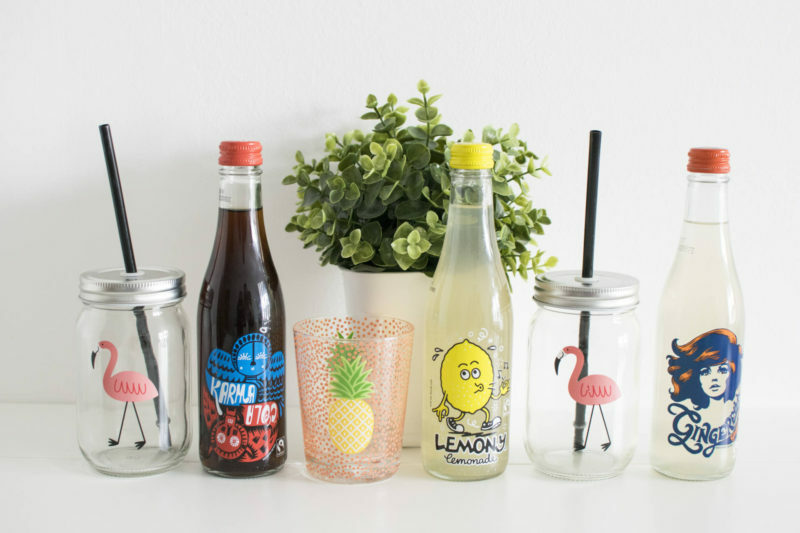 Fruity drinks are always going to be popular in the summer months, and it’s a great way to keep everyone happy without spending a fortune on spirits and taking up your time by making cocktails on the night. 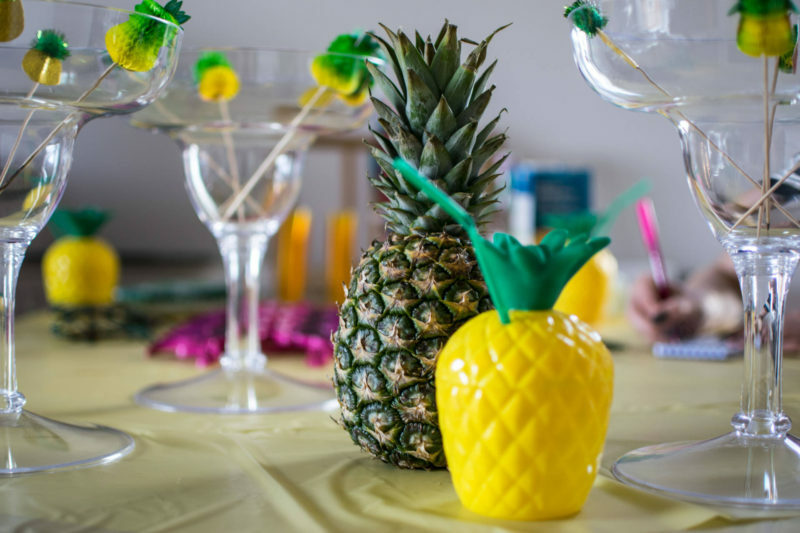 I want to thank Talking Tables for providing such a fantastic array of party accessories which made the night, the giant cocktail glasses were just perfect for our cocktails to share! 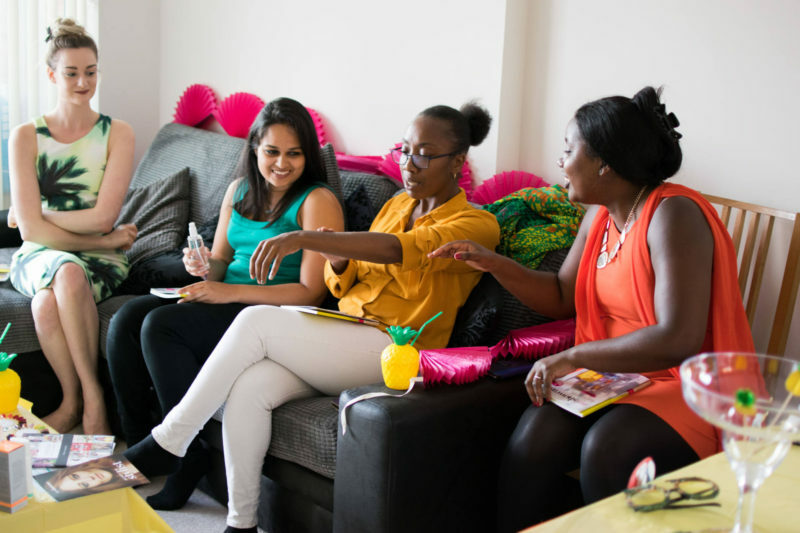 When planning how to do a ‘girl’s night in’ the right way, I wanted to organise something fun for us to enjoy as well as the selfies, drinks and food. This is where my second guest comes in- My Showcase. 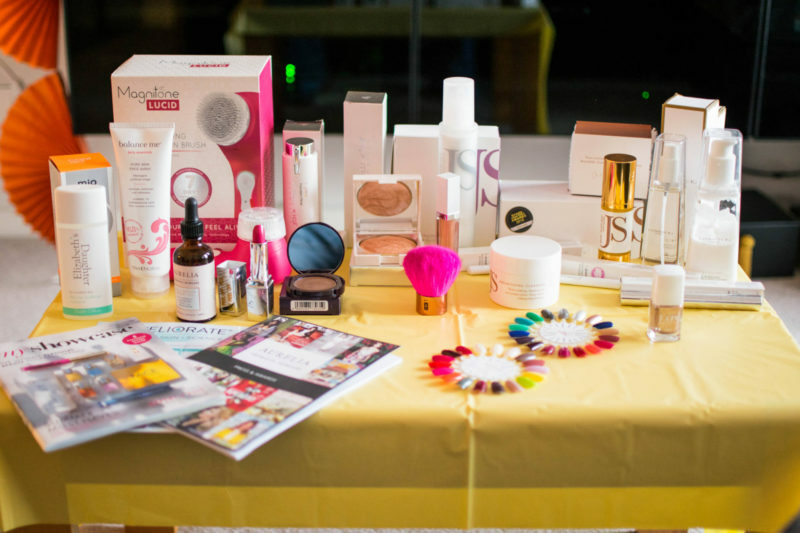 Founded by 2 great women, My Showcase is an online store for luxury beauty products, but they also host parties so you can have a My Showcase expert come in with their products to talk you through them. 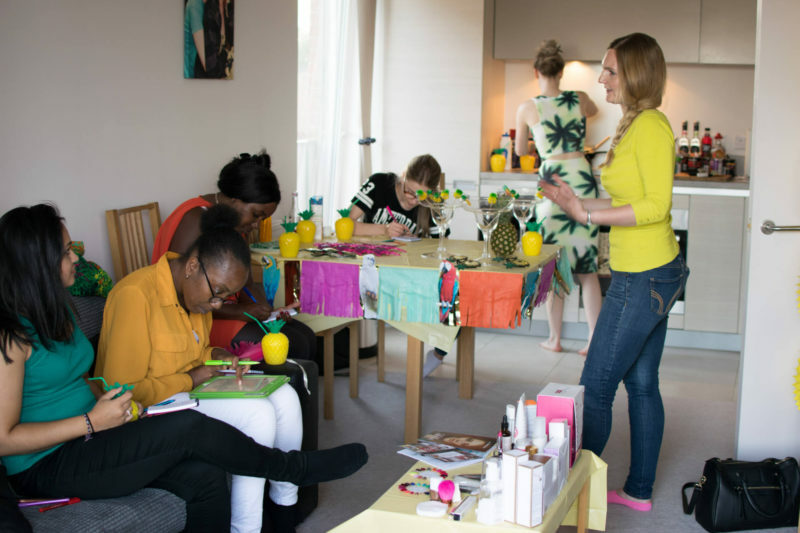 This was such a nice surprise for my guests who didn’t know what to expect, and we had a wonderful time trying on makeup and spraying ourselves with wonderful scents! A few stand out brands of the night were Connock London, New CID and Aurelia. 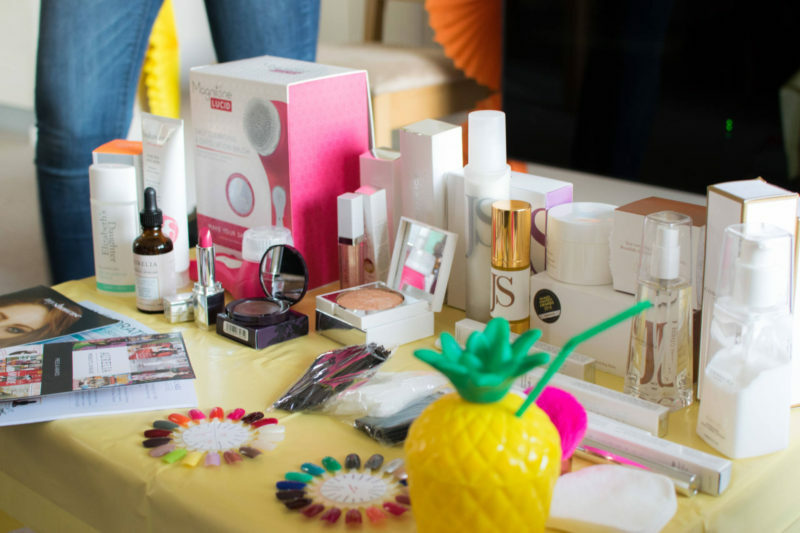 To get more info and to host your own My Showcase party, click here. 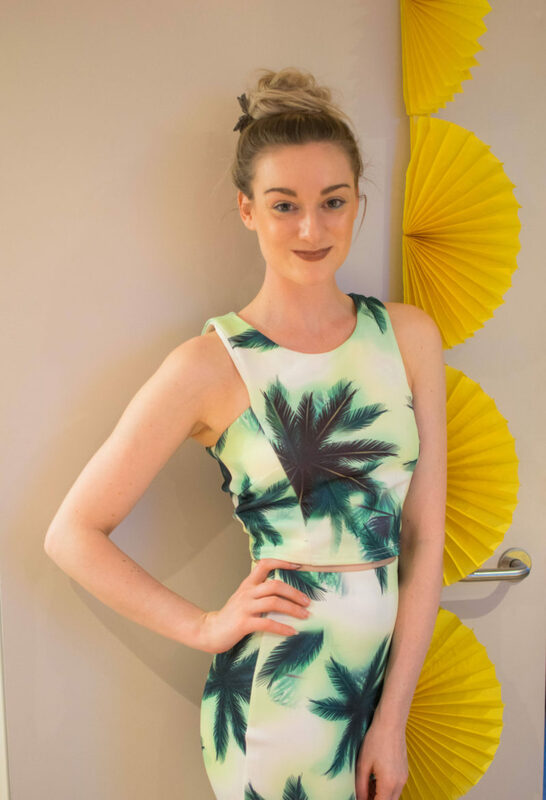 A massive thanks to our Stylist Katie for bringing her My Showcase selection for us! Plus a huge thanks to all my ladies who helped to make the party so great! 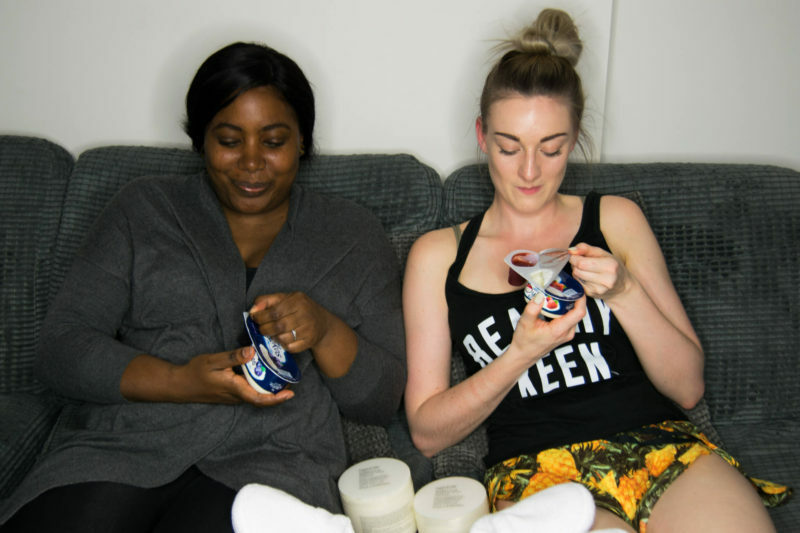 So there you have it, my how to do a ‘girl’s night in’. I would say to sum up, a mixture of the right theme, good home-cooked food plus a surprise for your girls will make your perfect night in! 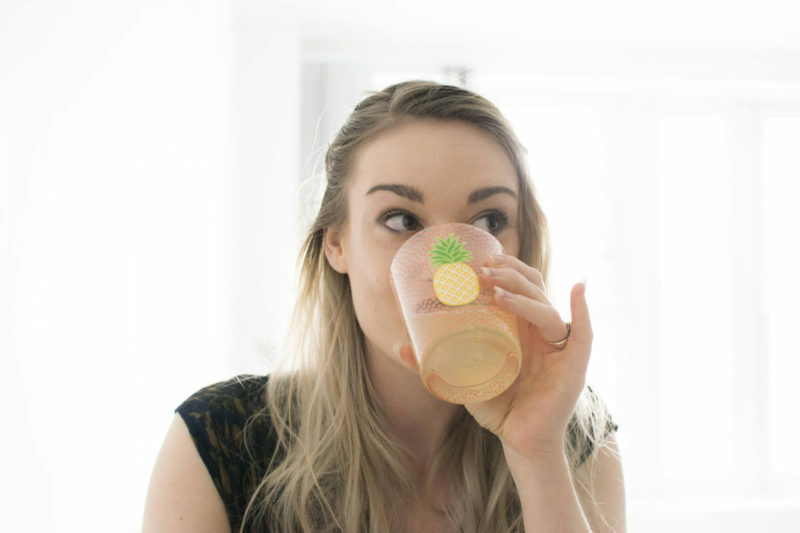 For more lifestyle, check out what’s on my wach list right now! I tend to stay away from the mundane and go for shows about fantasy/heroes/sci-fi as this has been something that has stuck with me since I started watching Buffy back in the late 90’s. 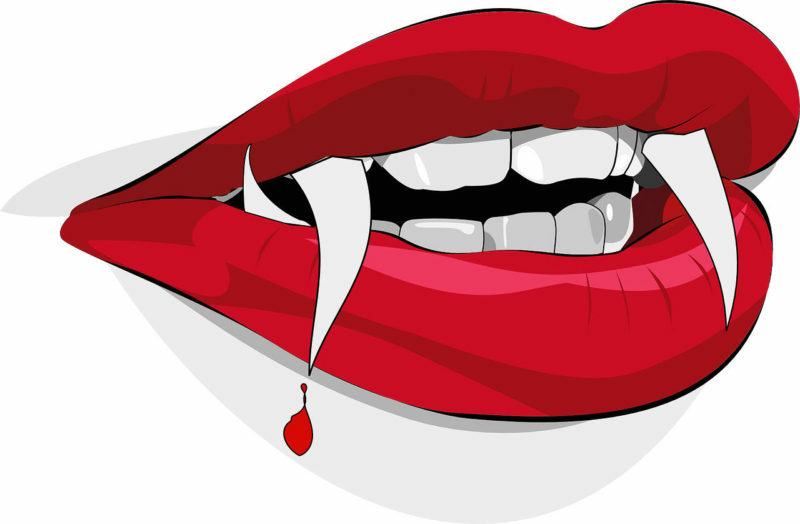 Vampires, witches & werewolves seem to grab my attention, and no matter how many shows there are about them (and there are a lot!) I tend to get hooked pretty fast. I have just caught up on The Flash and Arrow, so I’m left with Game of Thrones (soon to end too!) and Gotham. Gotham is a must see for any Batman fan, the show just gets better with each episode so loving this and I am part way through season 2. Netflix is definitely one to keep an eye out for. 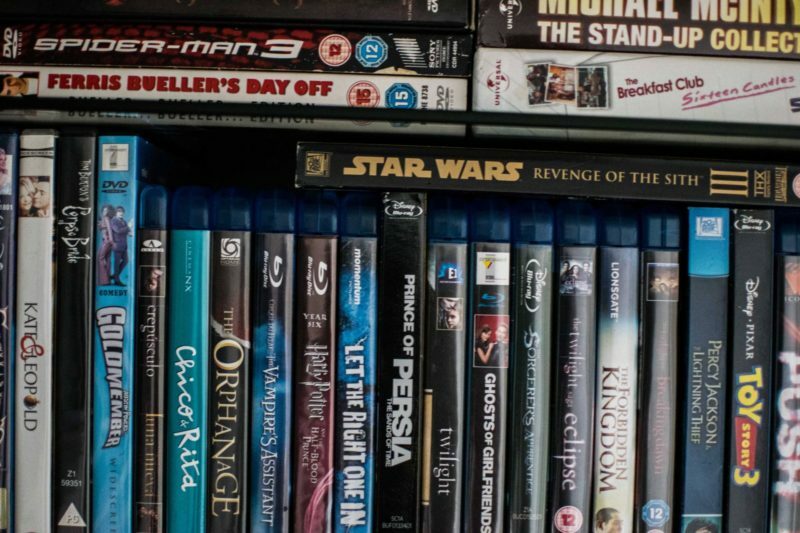 Shows like Daredevil and Jessica Jones added a much needed thrill to my screen this year and both of these are available to watch in 4K for the best viewing too! I will always love my classic John Hughes movies which sets itself aside from the usual genre I go for. From time to time I do love to go back and watch these old greats- who doesn’t love a bit of Ferris and the Breakfast Club?! What’s on my watch list right now though is more up to date. I am currently loving Amazon Prime’s Instant Video service as I get to watch great movies like X Men: Days of Future Past and The Martian, both available in 4K viewing mode! Up and coming on my watch list is definitely the new Suicide Squad film. 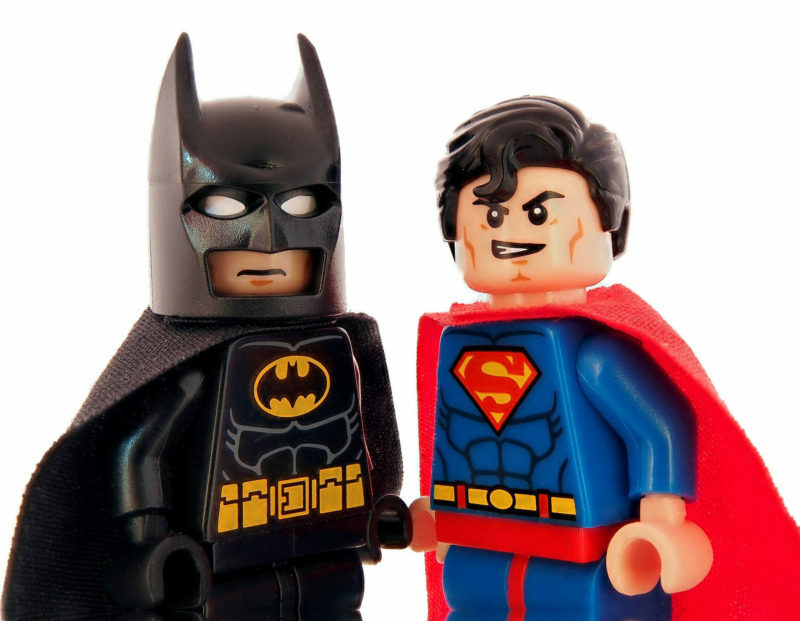 I must say I am more of a Marvel girl, but after the showdown bewteen last month’s Batman vs Superman, I am excited for another DC fix! I booked a day off work and so on Friday morning I packed my bikini in my oversized handbag and set off for Charing Cross from Canning Town. 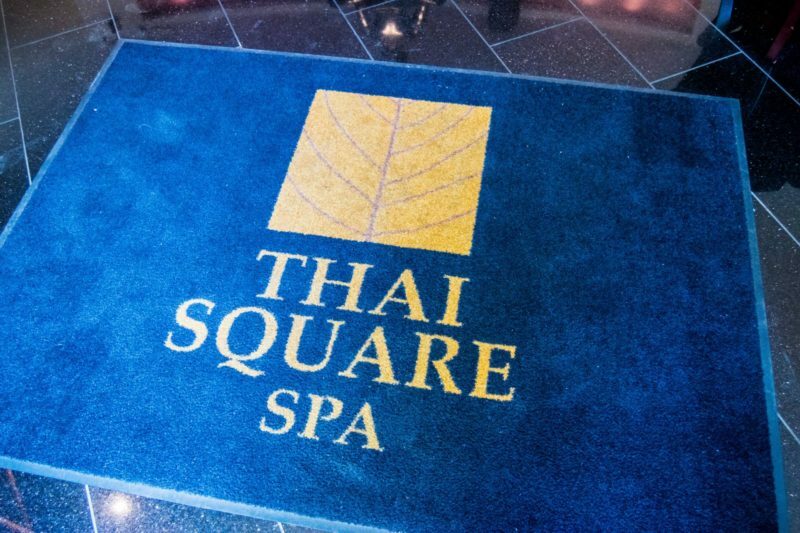 Thai Square Spa is about a 5 minute walk from the station and sits on the very corner of the block- it’s easy to spot as there are huge flags outside the building! 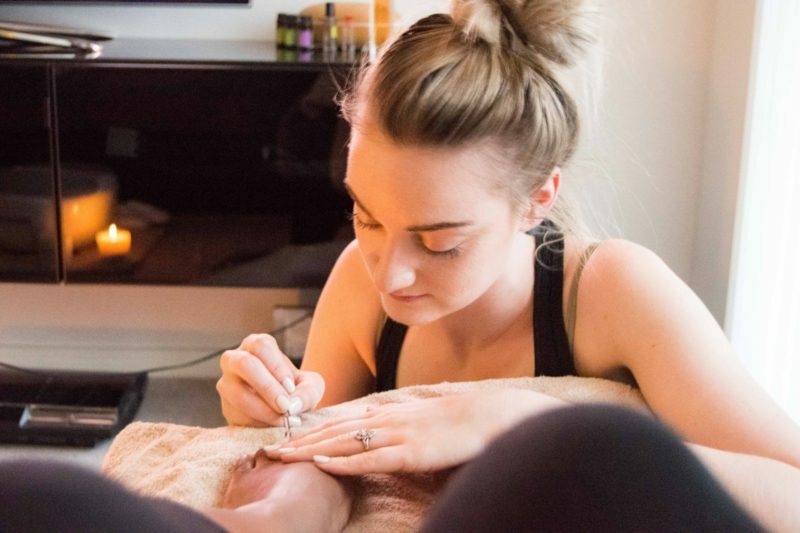 As I went in, I was immediately greeted by reception, and I confirmed that I was booked in for a signature wrap and use of the facilities after my treatment. The reception area was decorated so nicely and had a lovely relaxed feel as soon as I was inside. 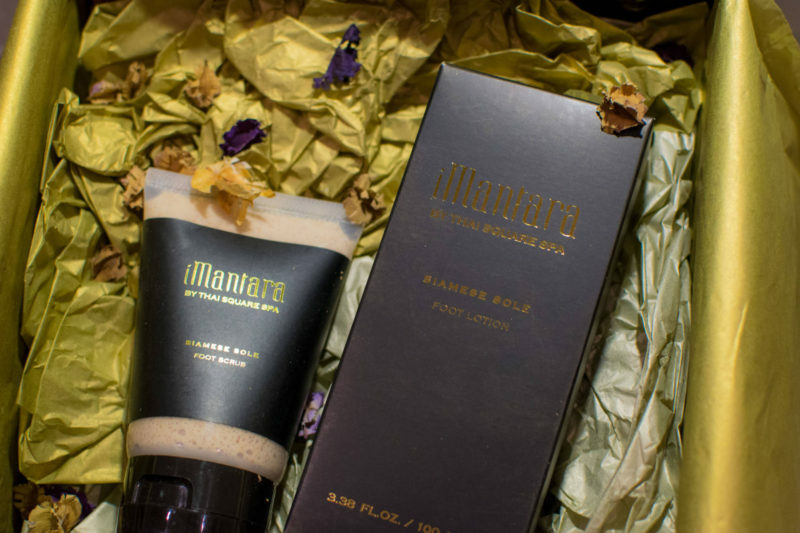 The iMantara range of products affiliated with the spa was on show and available to purchase if you liked. 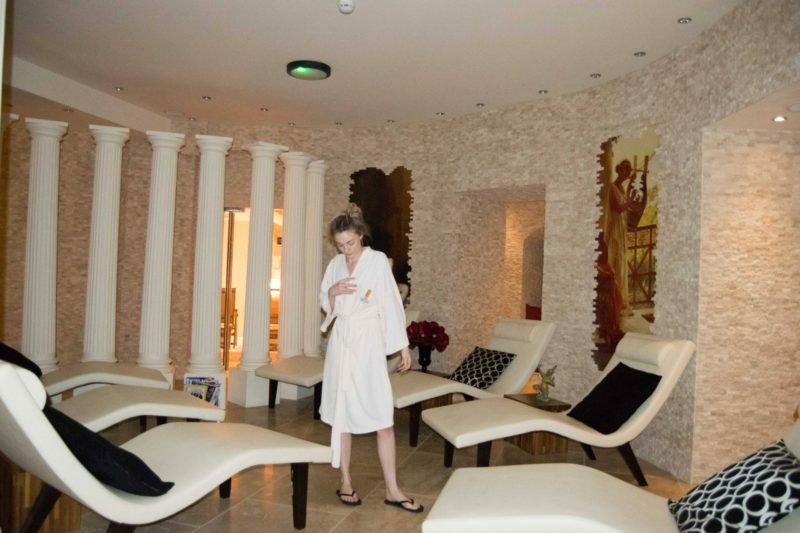 I have tried the Siamese Sole foot scrub and lotion which are absolutely divine. 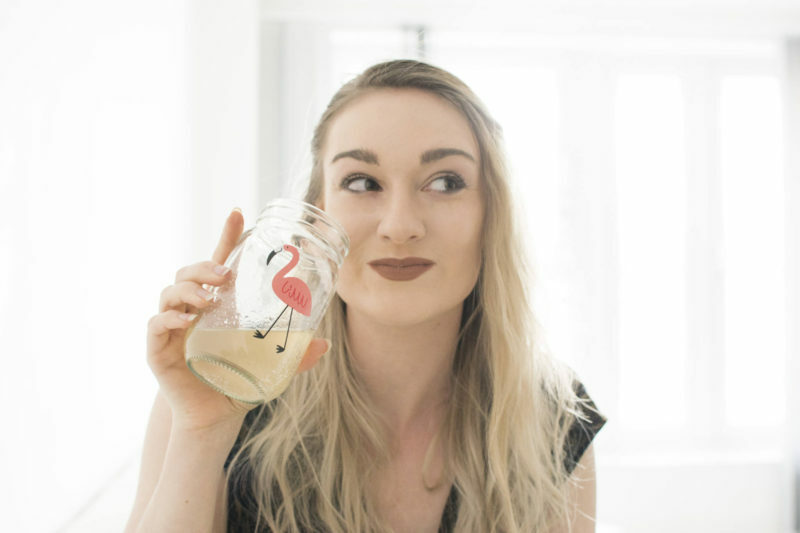 The scents are so unique with hints of tea tree, orange and jasmine, and the brand is against animal testing which is something I always look out for. 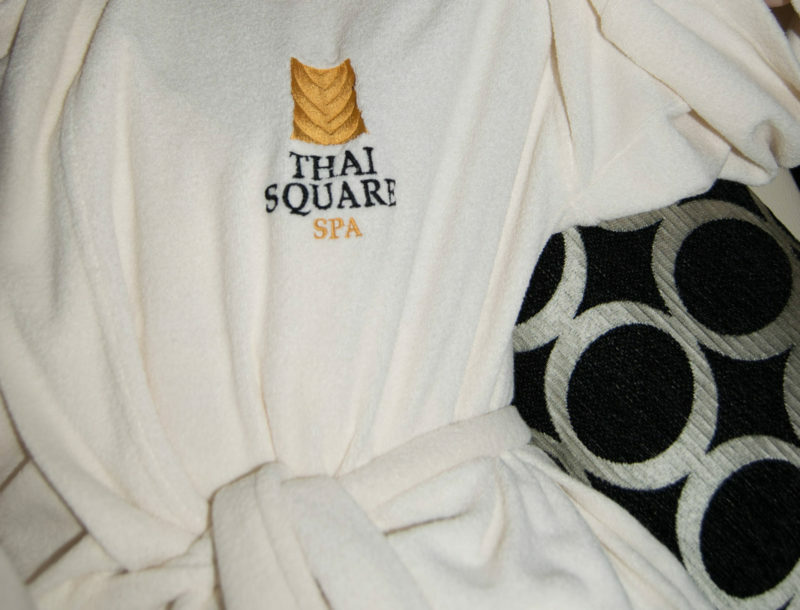 I had a Thai Square Spa Signature Wrap, which I was quite intrigued about when I saw it on the website. 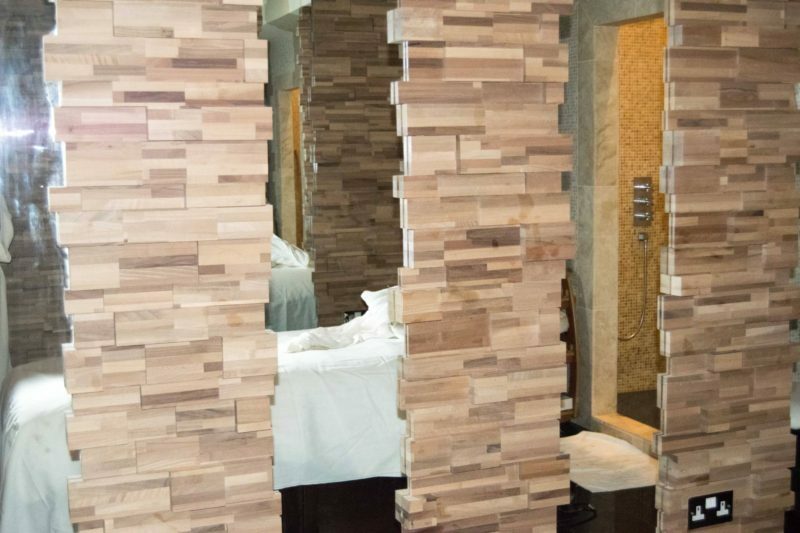 I had only ever had massages before and so was up for trying something new for a change. The treatment started with a lovely foot soak from my therapist. She used salts and warm water to cleanse my feet while I enjoyed the signature blend of herbal tea from Thai Square Spa. After that, I got onto the massage table face down, and I had the cool algae painted on me from my feet all the way up to my shoulders with a brush. 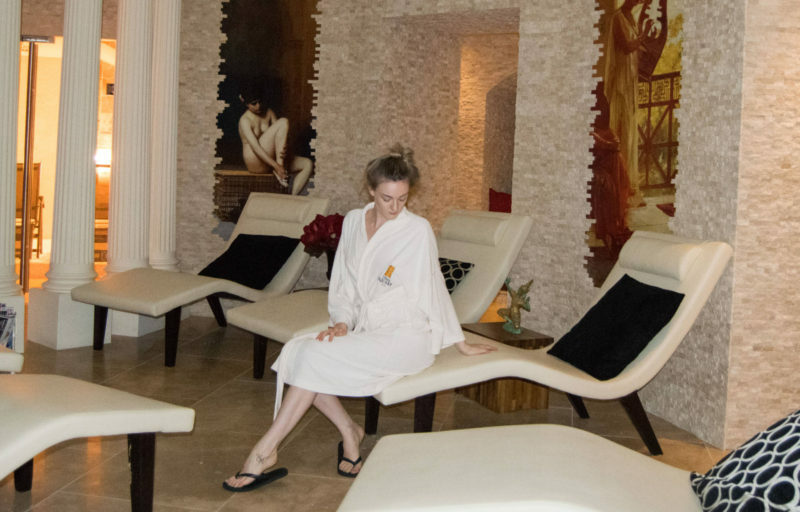 It was really soothing and the massage bed was heated too so that it started to dry and harden on my skin. I turned over and the process was repeated on my front half. Not going to lie, the belly felt the cold more than the rest of my body, but it wasn’t unpleasant at all. After this, I was wrapped up like a china doll in loads of towels, and left for 15 minutes for the wrap to soak in. It was lovely and toasty, any more than 15 minutes and I would have definitely fallen into a deep sleep! After this, I showered to remove the wrap and my skin was super silky. 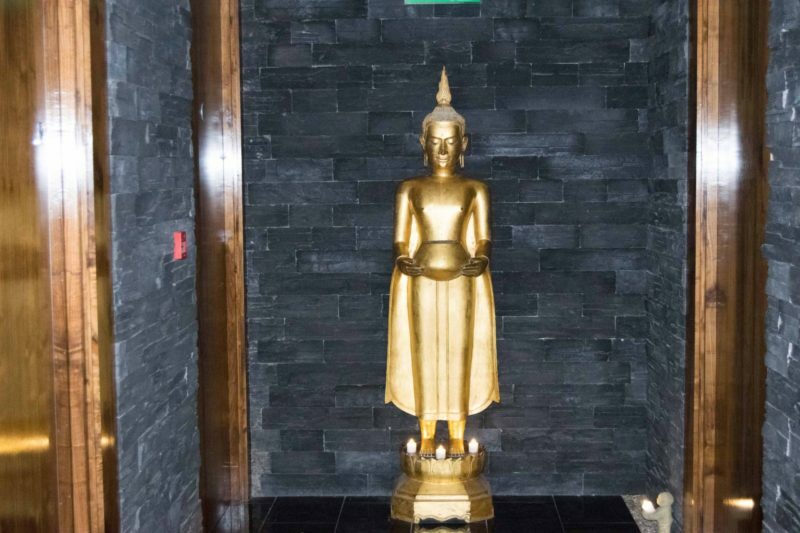 Once finished, it was time to venture round the rest of the Thai Square Spa facilities. 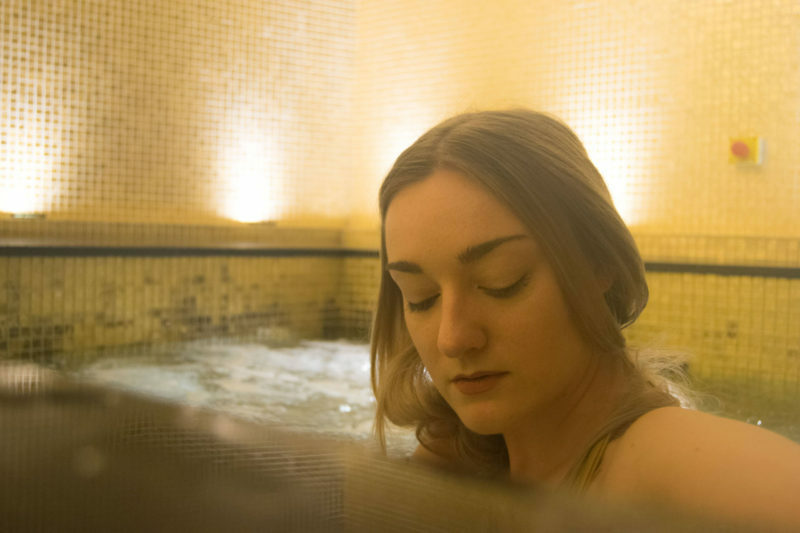 I pretty much had the spa to myself, so it was the perfect time to take some shots! 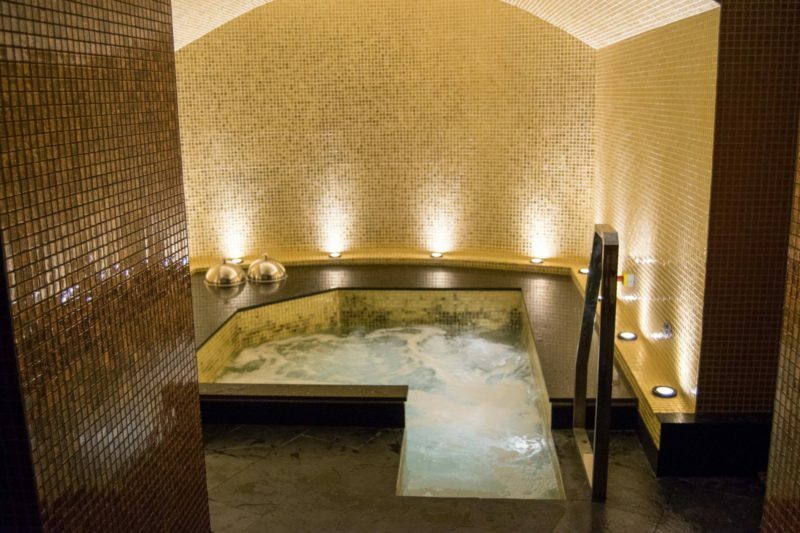 Here is the central point of the spa. There are plenty of chairs to lie back in and remove yourself from the busy London city, I was completely blissful as I sipped my tea and enjoyed my lazy afternoon. 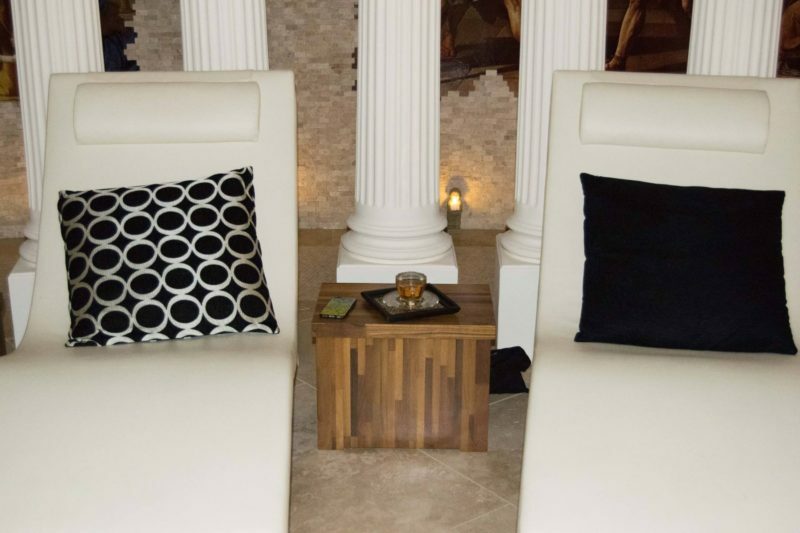 The jacuzzi and steam/sauna rooms are in a separate chamber just past the lounge area. It was so nice to feel the warm bubbles of the jacuzzi, I felt like I was back in Dubai again! 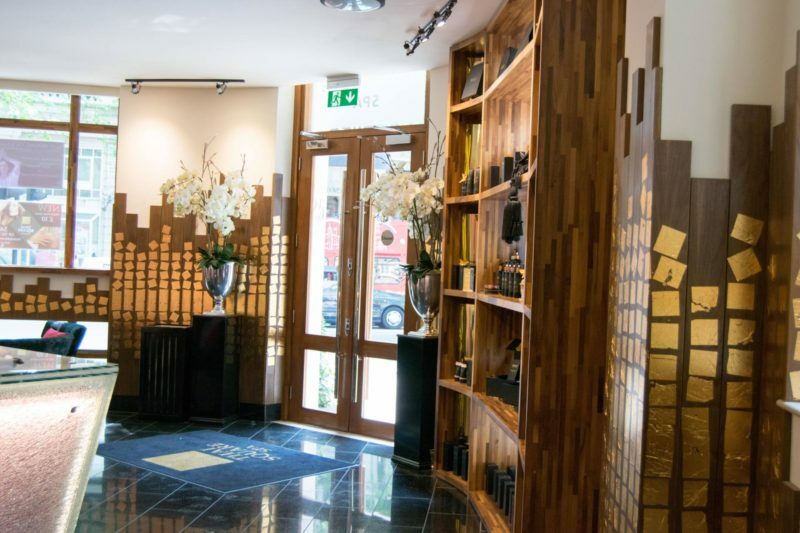 Thai Square Spa London is the perfect place to get away from everyday life and have some luxury pampering. I went by myself, but I can definitely see myself going back with Paul or maybe some girlfriends too for a great time. 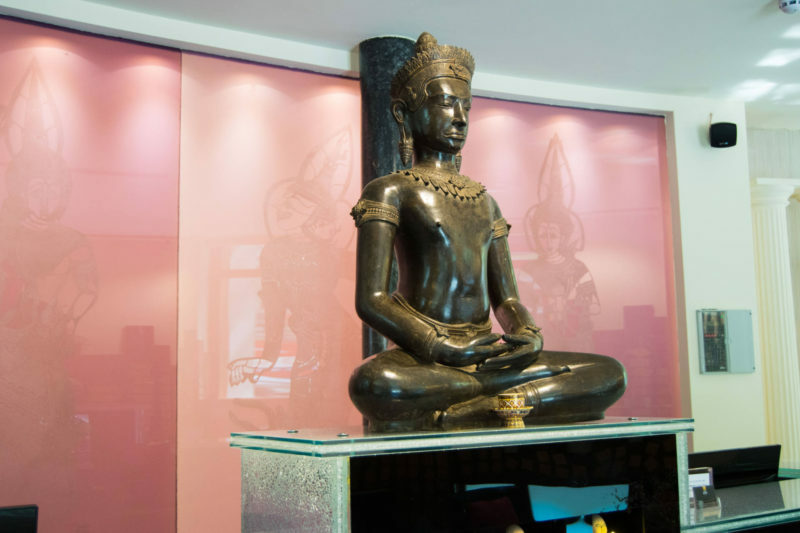 Thank you to Thai Square Spa for having me, and I will be seeing you again soon! To celebrate World Environment Day, I wanted to do something a bit different on my blog. 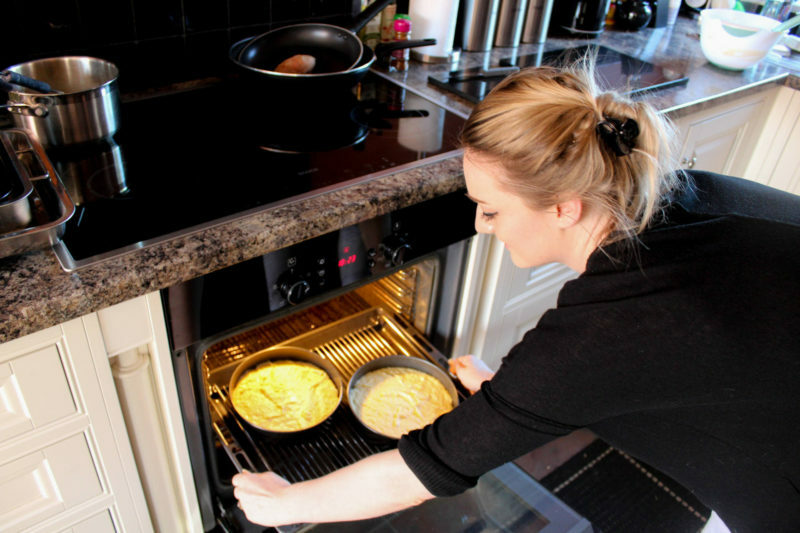 I have previously reviewed gluten free products, and even done a step by step macaron post, but I’ve never done any of my own recipes on here before. 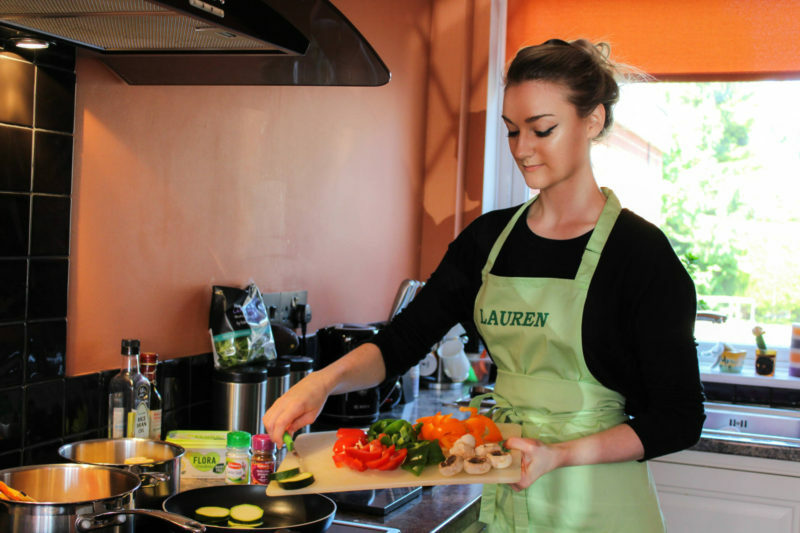 So now is my chance to show you all that I can actually cook too! 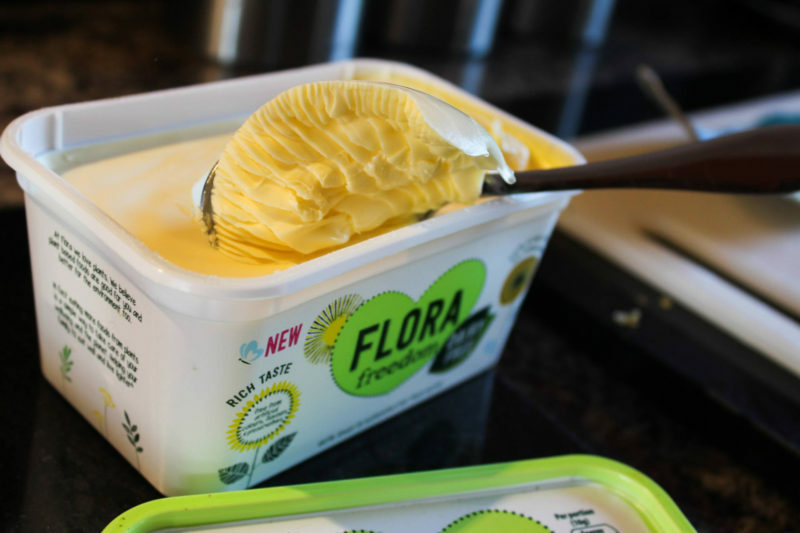 This post is all about going green and reducing your carbon footprint by using a brand new dairy/vegan friendly butter- food from Flora Freedom! 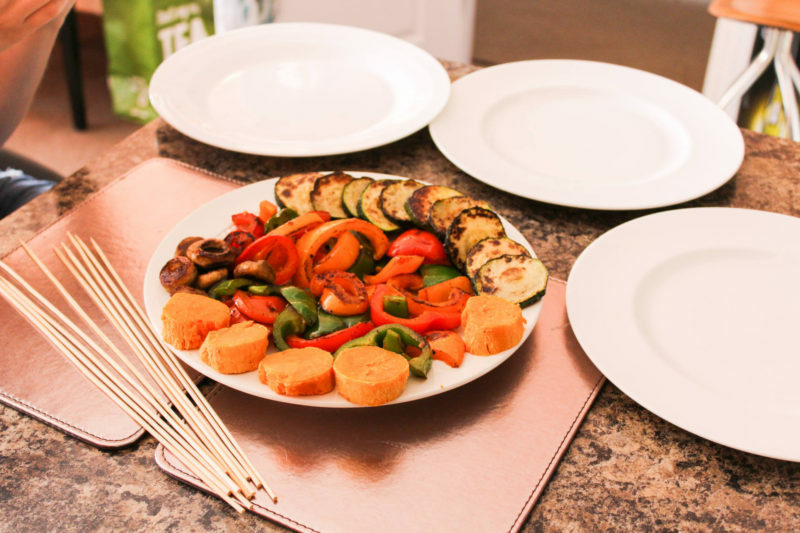 Chop your veggies up, not too small as we need to put these onto skewers! Start the rice first as this takes the longest. I boiled the rice for 20 mins in 1 pnt of water, and added in a little pepper and garlic salt. I also boiled my corn in a separate pan too, I did them for 15 mins. 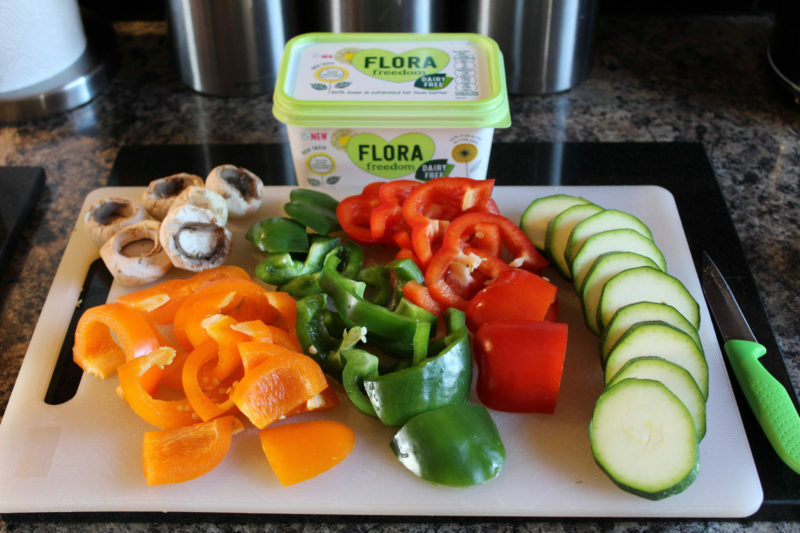 Fry the raw veggies all up (I did peppers separate to the courgette and mushrooms) with a tablespoon of Flora Freedom and season with some jerk spice- fry until golden brown. I did the sweet potato in the microwave (5 mins), and then sliced them into round sections and peeled of the skin last, et voila! You are ready to skewer. I used the baby spinach to lay the kebab on top of, so pretty! 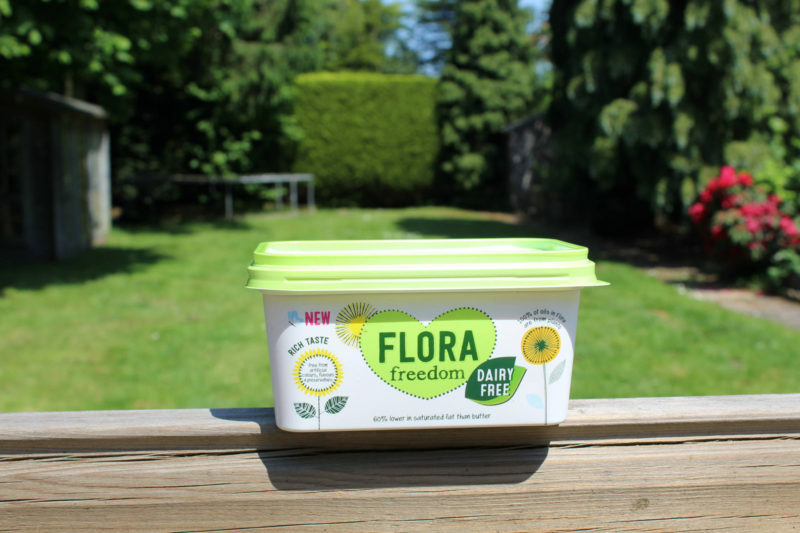 I used the Flora Freedom on my corn too! 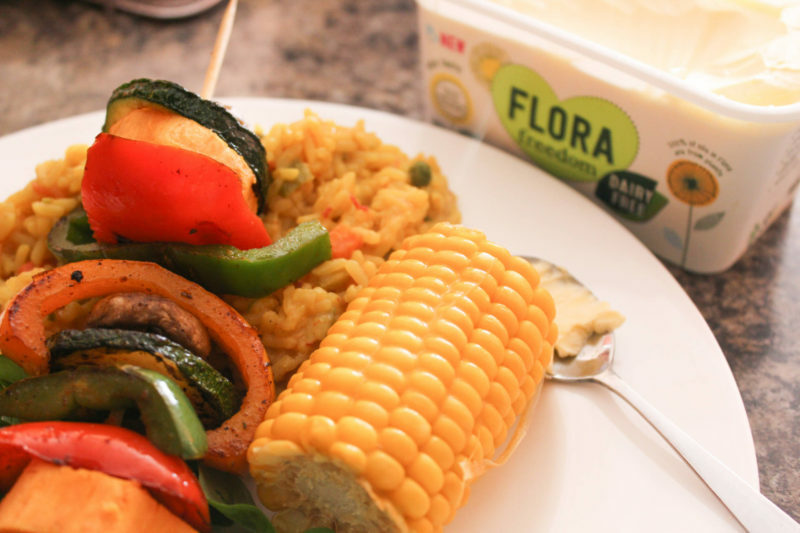 A gorgeous, vegan friendly meal in under 30 mins. Then add in the gluten free flour bit by bit, and carefully fold into the mixture to lose as little air as possible. 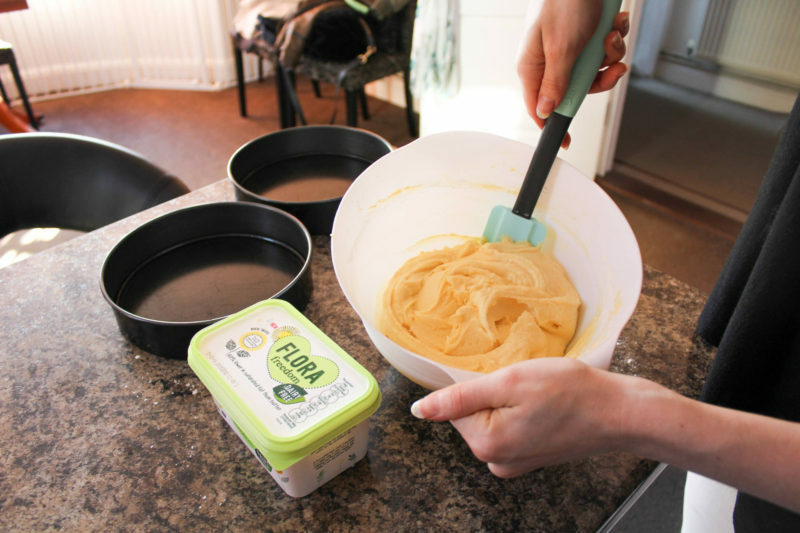 Once you are happy with the consistency of the mixture, separate out into 2 cake tins, and shake tins back and forth so that the mixture evens out and touches all the sides (we don’t want a wonky sponge!). Place into the oven for about 30 mins. I usually don’t rely on exact timings, normally your nose will tell you when it’s just right! 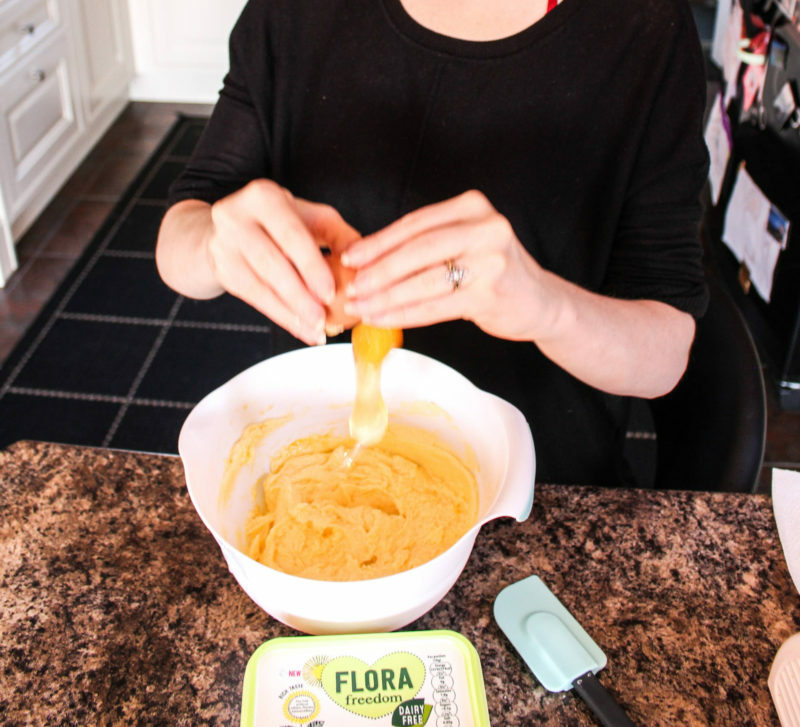 If unsure, stick a knife into the centre and if it comes away clean, your cake is done! 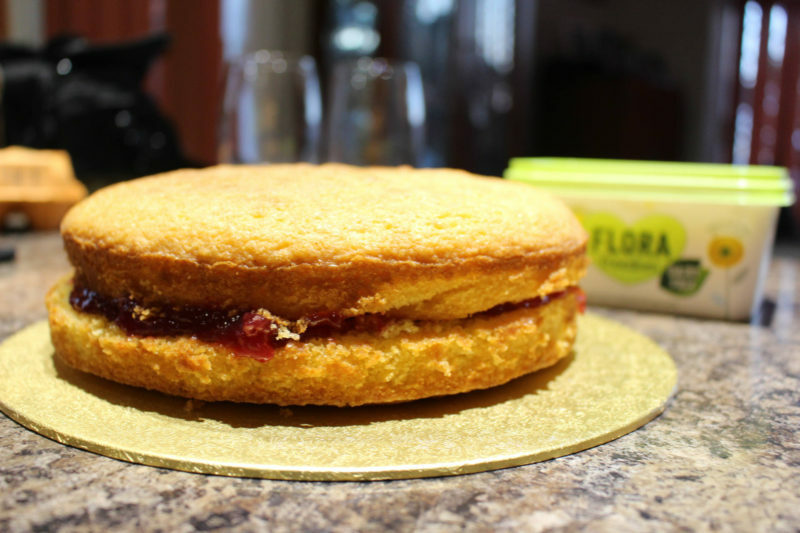 Once cooled, take out of the tin, and add a nice layer of raspberry jam into the centre before placing the top tier on. 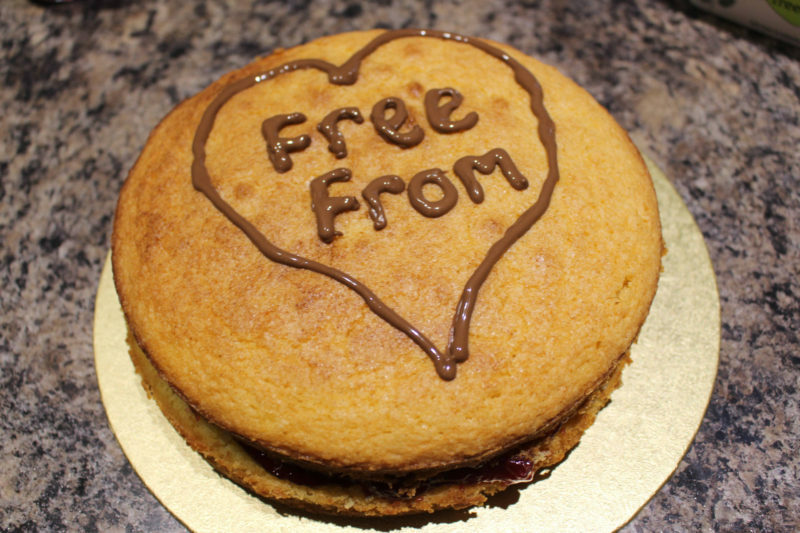 You can leave as is, sprinkle with some icing sugar perhaps, or decorate it however you like! 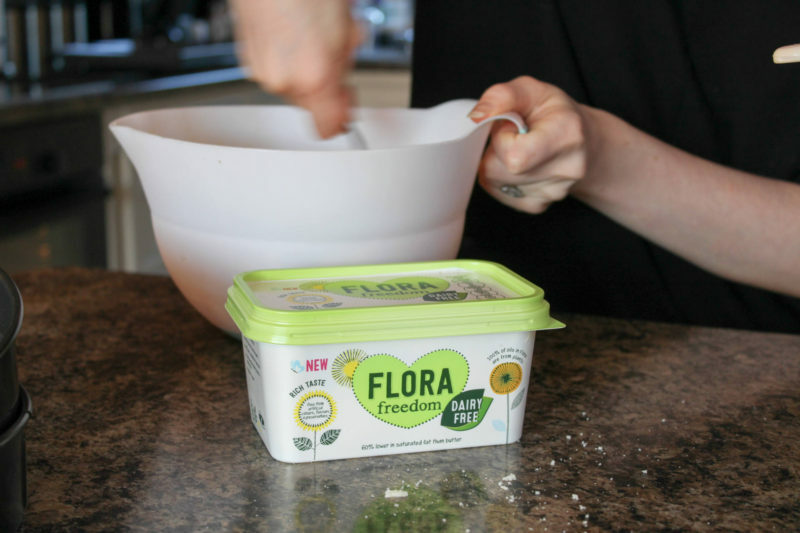 So there you have it, 2 quick and easy recipes you can use to cater for allergy sufferers and vegetarians, plus at the same time you are helping to reduce the carbon footrint by switching to a dairy free spread too! 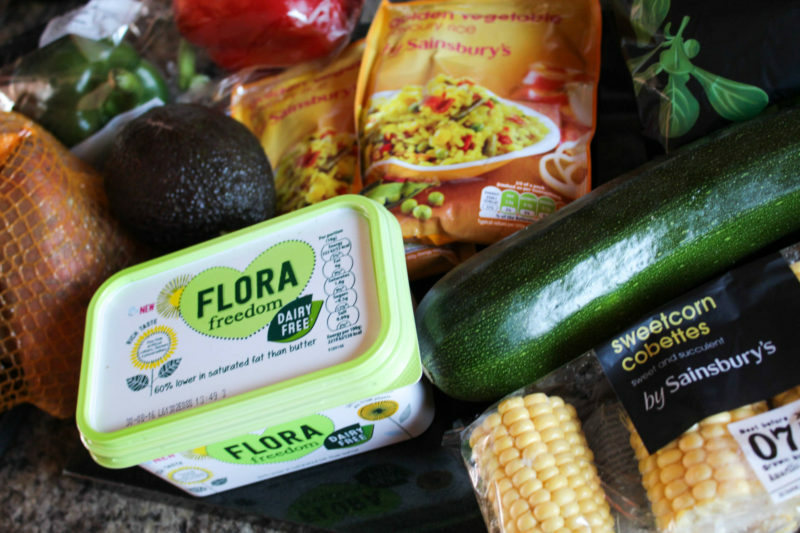 It tastes just as good as your regular spread so why not try these recipes out for yourself? 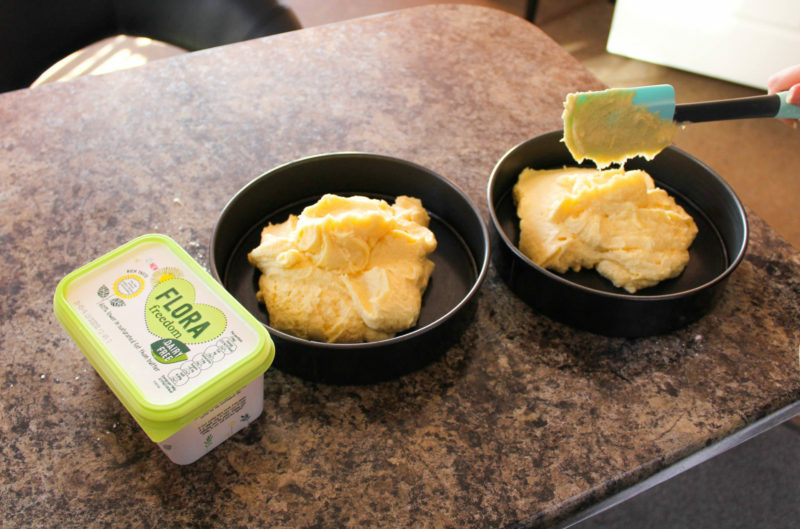 Food from Flora Freedom in my opinion was a great success! 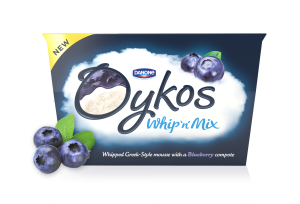 For more food and fun, check out my DIY spa night in with Oykos Whip n Mix! 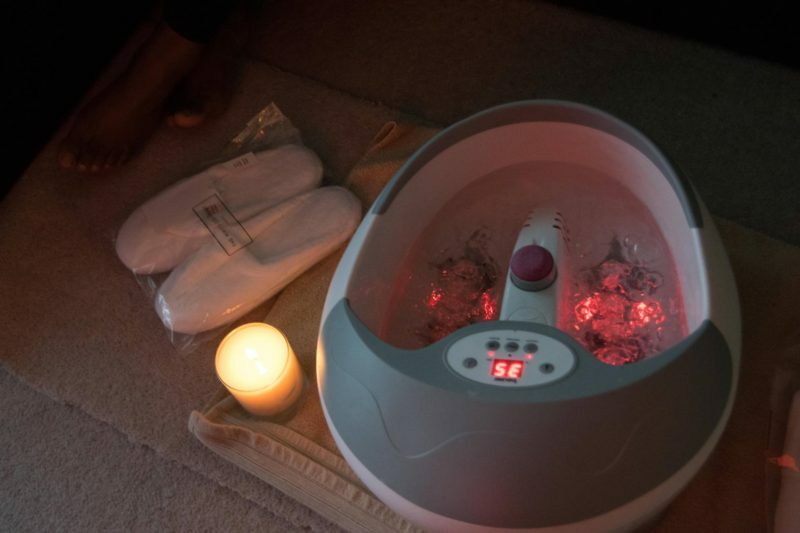 We lit some candles, and I brought out my foot spa to help us start to forget about our day at work. 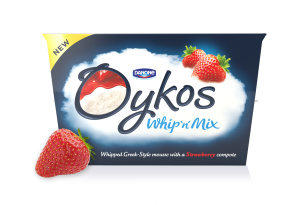 Getting the Greek treatment with Oykos was working out well so far! I ate some of mine as it would be a crime not to, the whipped yoghurt and fruity compote is just amazingly good! 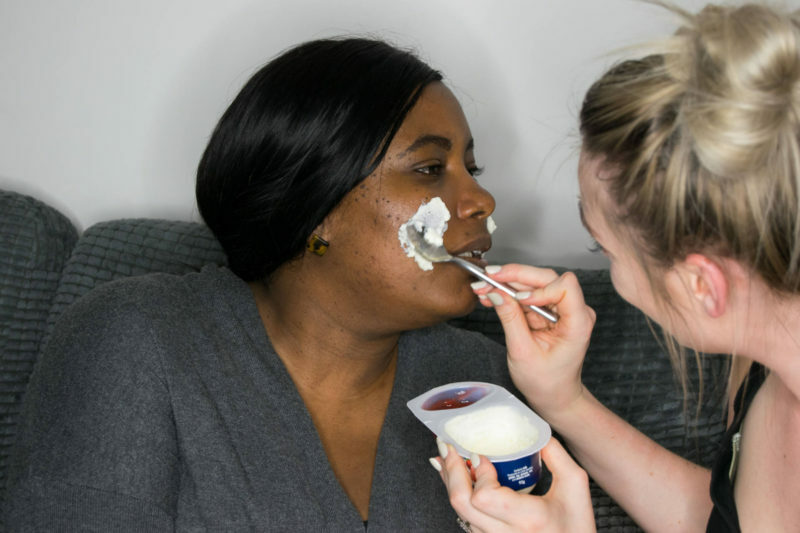 I then got some yoghurt, and told Merrell to sit still… as it was going on her face!